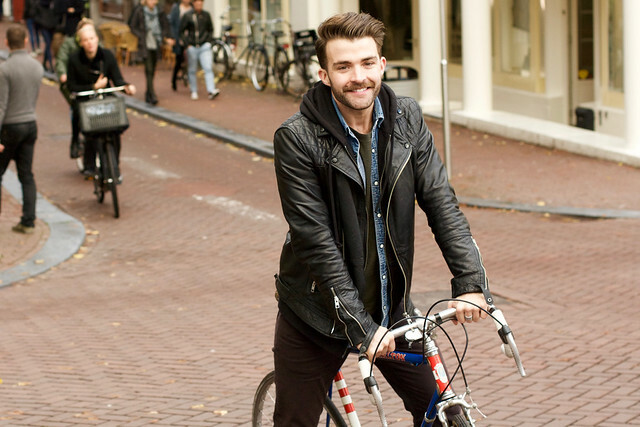 Alex is a German expat from Hamburg who has been living and working in Amsterdam for a decade. In 2015, he founded The Coffee Vine, a blog turned monthly subscription box for caffeine addicts to try new varieties of beans each month. Today, he’s sharing a bit about his life on two wheels, so pour yourself a cup of joe and keep reading to learn more. Welcome, Alex! 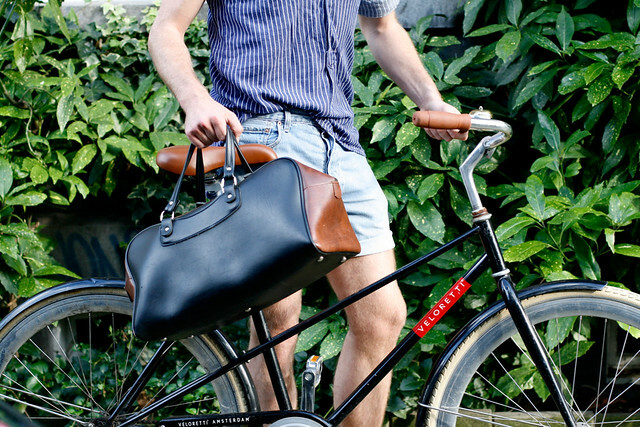 We’re excited to have you in our Cycle Chic Spotlight series, let’s get started. How did you end up in Amsterdam? I came here rather unexpectedly, at first Amsterdam wasn’t my radar at all. I was living in Hamburg and recruited at a large FMCG company. Funny enough, I didn’t really enjoy Amsterdam after two rather disappointing holidays here but ten years later, I am still live in Amsterdam and loving it here more than ever! 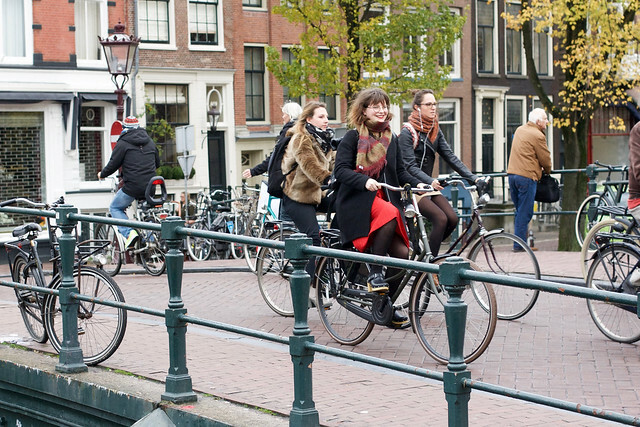 How cycle friendly is your hometown compared to Amsterdam? Hamburg is a really big city and despite having an excellent public transport system, many people still prefer to drive. 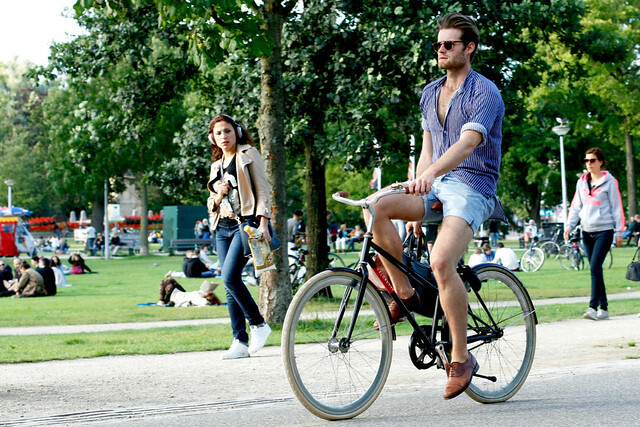 Over the past few years cycling in Hamburg has become a lot more popular and safe. 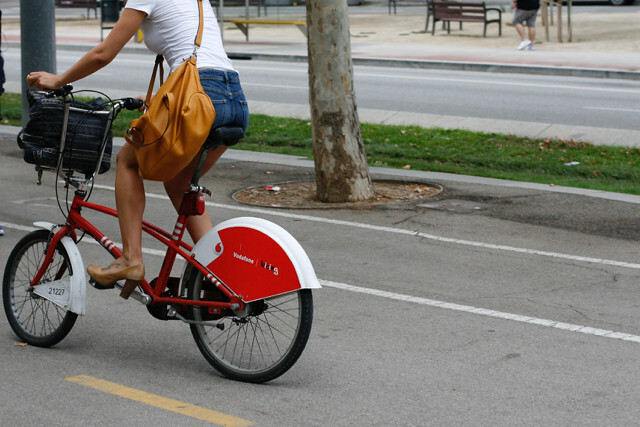 Now, there are bike sharing programs and the city has implemented a lot more bike lanes. That’s a great change to witness. 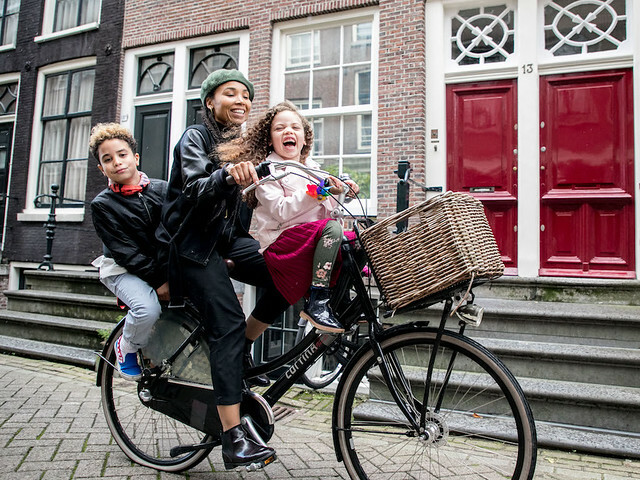 Tell us an eye opening experience about cycling in Amsterdam. Living in Amsterdam definitely changed my view on cycling. It has become a way of life for me now rather than a necessity. In the beginning, I was a bit weary of cycling in the city center because the Dutch can be really aggressive but it’s funny how quickly you assimilate. Now, I sometimes catch myself cursing at tourists too. A few years ago I used to work out in Amstelveen so, I had a scooter. Obviously, it was a lot faster and less exhausting but I was the only person in my circle of friends with one. Now I sold it and became regular cyclist again, I realized how much I actually hate scooters in the bicycle lanes! 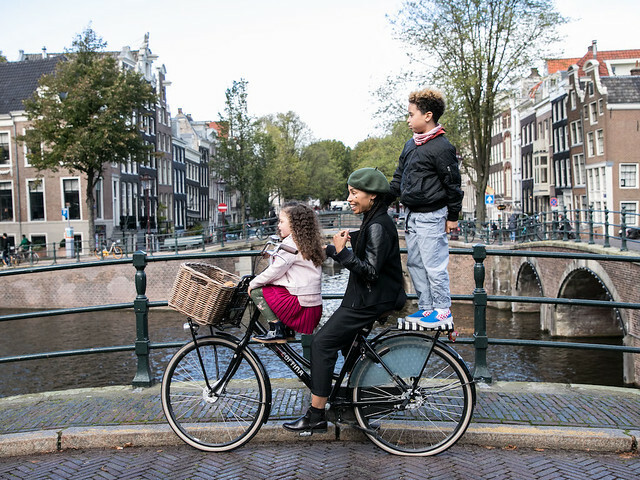 What is a typical day in Amsterdam like for you? I usually get up at 7:30, cycle to my gym, then back home to get ready before I settle into work – either from home or at my workshop which I also bike to. I love my neighborhood, De Baarsjes. It’s a vibrant my neighborhood close to so many parks. I’ve got Sloterplas, Rembrantpark and Vondelpark all within a 10 minute cycle from my house. My work is very close to my house and it’s not very scenic. When I go from Oud West to De Pijp I love going through Vondelpark and soaking up the greenery. Running my own business, I don’t really have a set work schedule, which is really nice because I can grab my bike and pop out for lunch with friends or go to other meetings. 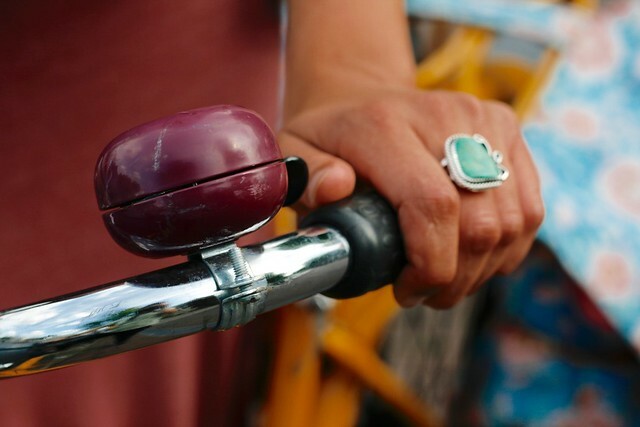 It’s great to get fresh air and cycle around the city. 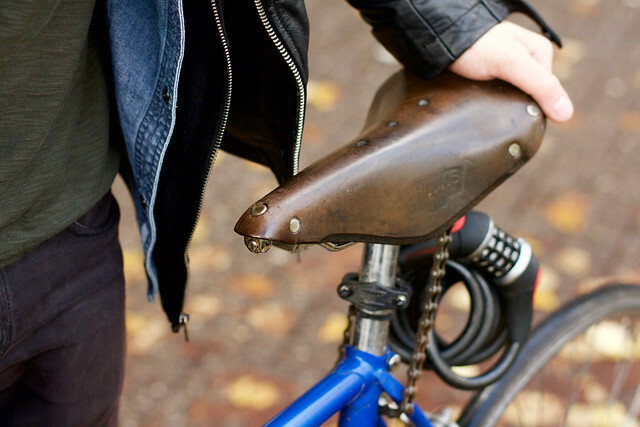 What’s something special about your bicycle? My bike is actually just a simple Cortina ladies bike. 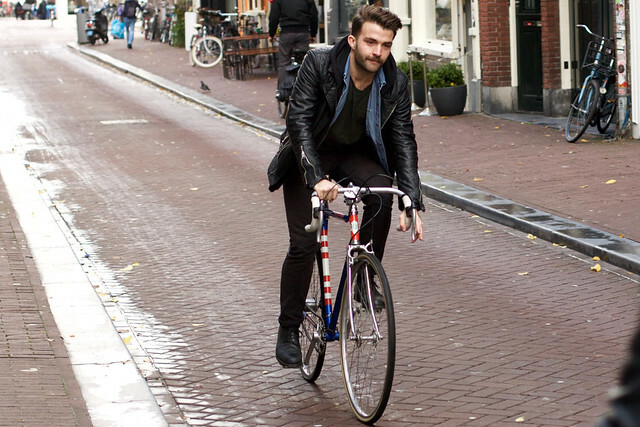 I don’t like the bar across the middle that men’s bikes always have so this one works better for me. I don’t have any flashy details or accessories but of course, I do have a cup holder on the front for my cup of coffee on the go! Now and again, I need to take a coffee box to a customer or a partner. I hold it in my hand when cycling and I feel like I can show it off a little bit! We feature different artists on the sleeve from time to time, I am really proud of our custom branding. What are your favorite places in Amsterdam for coffee? At the moment, my favorite spots are NewWerktheater, Toki and Scandinavian Embassy. What inspired you to launch The Coffee Vine? I began drinking coffee during trips to the U.S. with my dad. He always loved getting big lattes from Starbucks and sprinkling cinnamon on top and that sort of got me into it. Over the years, I developed a more refined taste for coffee and a real interest in specialty coffee. Then, I realized an opportunity to combine that love for coffee with my passion for writing. The Coffeevine started out as a blog about the best coffee bars in Amsterdam and further. Through my blog, I met a lot of key people in the coffee industry so, when I launched my coffee subscription I was able to cash in on my strong relationships with the best roasters. This really helped because they already knew me and trusted me. When I left my last job, I launched our coffee subscription in 2015 and that’s what I still do today. It’s exciting to work with something I am really passionate for! Thanks for sharing your story with us Alex, happy cycling! 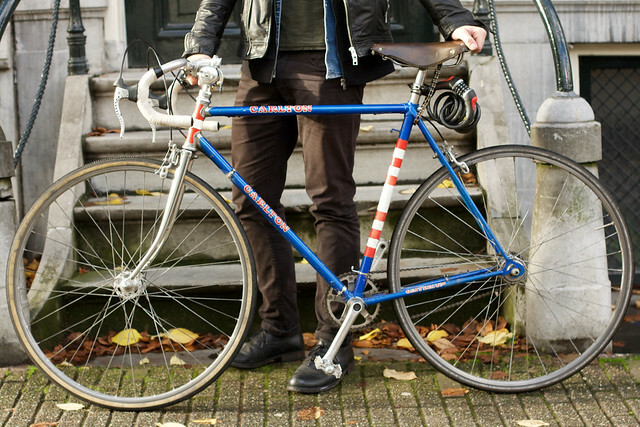 Jonathan is an Amsterdam based designer from the UK with a passion for all things retro. He loves working with his hands to make his creative visions come to life – whether it’s designing shoes for international fashion brands, reconstructing vintage furniture or working on his collection of vintage bicycles. Welcome, Jonathan! We’re glad to have you as our December cyclist of the month! 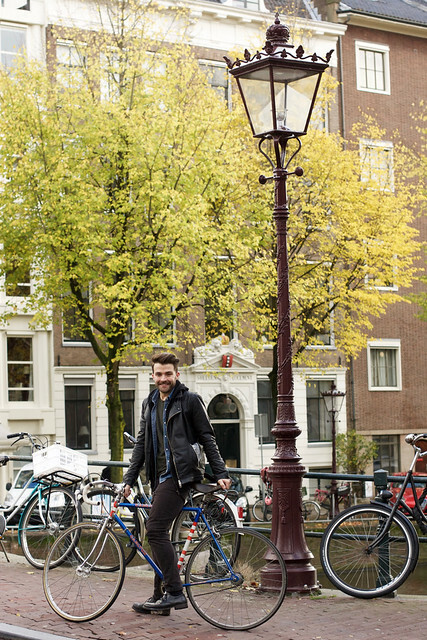 To get started, tell us a bit more about how you ended up in Amsterdam. I’m originally from the UK, more precisely from where Hobbits live. Yes, that’s right. Lord of the Rings was actually written in my hometown. After visiting Amsterdam for a long weekend, I fell in love with the city! One month later, I found myself moving over. That was about two years ago… and here we are now, enjoying a crisp, cool day in the lovely Nine Streets neighborhood. As an expat, what was your first reaction to the Dutch cyclists here in Amsterdam? At first, it was all so unique and quite startling!Now, cycling has become a major part of my day-to-day routine here in Amsterdam. The Dutch are known as the kings of cycling but it was a totally new concept for me after living in London for 10 years. Unfortunately, in London there’s a lack of forward thinking towards cyclists which makes it quite unsafe. Now that I have adapted to life-on-bike, I absolutely love it! Cycling around the Jordan with friends is one of my favorite areas because of course, the scenery is lovely. Plus, it is more peaceful and less crowded than the rest of the city center. Riding my bike has become a bigger part of my life. Cycling in Amsterdam really inspired me to start buying vintage bikes and do them up, which is now one of my favorite hobbies. 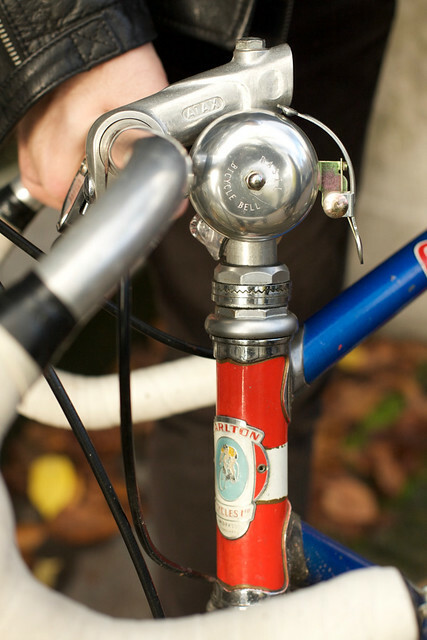 How did you get into collecting vintage bikes? 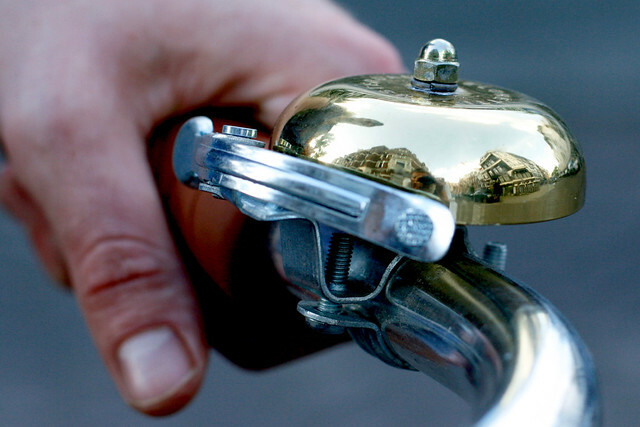 I love the hands on process of fixing up vintage bikes. 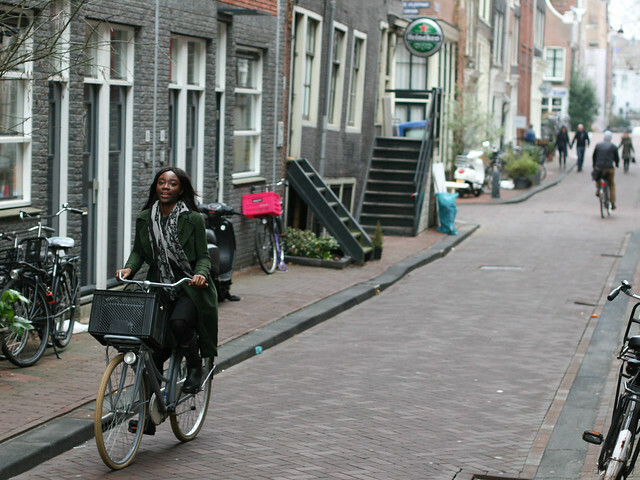 Plus, of course the bike loving vibe of Amsterdam is an inspiration. A few years ago, I bought a bike black, vintage Peugeot. It was from 1975 in like-new condition, just beautiful! Once I got my first vintage bike there was no looking back, I was in love! Now, I’m a vintage bike enthusiast. At one point, I did have seven vintage bikes so, perhaps you could call me a “collectomaniac”? At the moment I am down to only three, including the Carlton pictured here. My other prized bike is a 1982 Peugeot Centennial Edition PH12, this was one of the first bike to consider aerodynamics, it has only been ridden twice since 1982! At the moment, it’s hanging on the wall of my apartment. My third bike is a Peugeot that my dad bought brand new in 1975, when he was 13. What’s the story behind the unique, vintage Carlton that you’re riding around the Nine Streets today? The one pictured here is a Carlton criterium custom which I built myself after bringing it over from the UK.The bike was owned by a family friend who bought it new. He was a long distance rider so, I have had it the bike has undergone some changes and I still want to change it further and make it into a single speed. This is the first bike I built myself and added a Basil bell and Brooks seat. I’m very proud of it! Carlton is up there as one of my favourite brands. 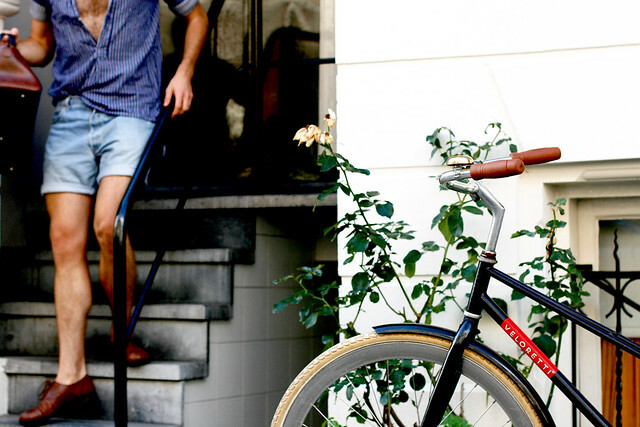 My dream is to one day I have a Bianchi Pista too, they’re absolutely beautiful. So far, I have yet to find one the is in good enough condition… Hopefully some day! 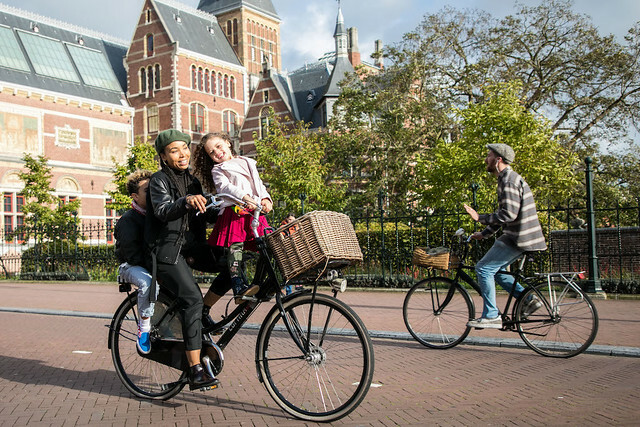 What’s your favorite aspect about cycling in Amsterdam? 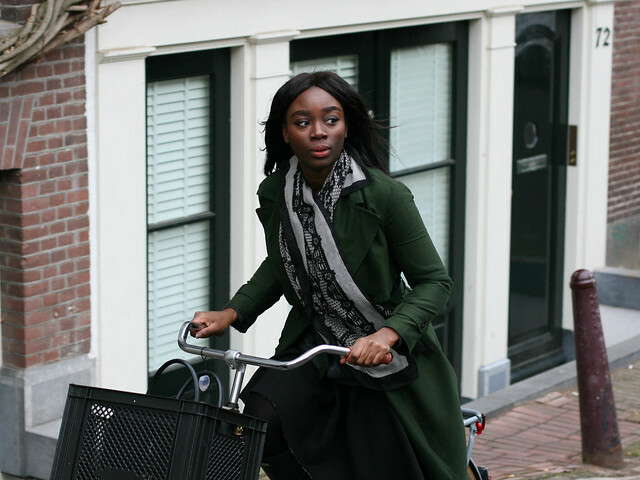 My favorite aspects of cycling in Amsterdam are the people you run into along the way. When biking around town, I often spot a friend cycling by and we wave or shout, ‘Hello!’ You often see the most random scenes pop up out of the blue. It’s fun to capture a quick snapshot of wacky moments on my phone and share them with friends for a laugh. I get so much enjoyment from riding my bike everyday in this wonderful city. Thank you, Amsterdam! Interview & photos by Lily. 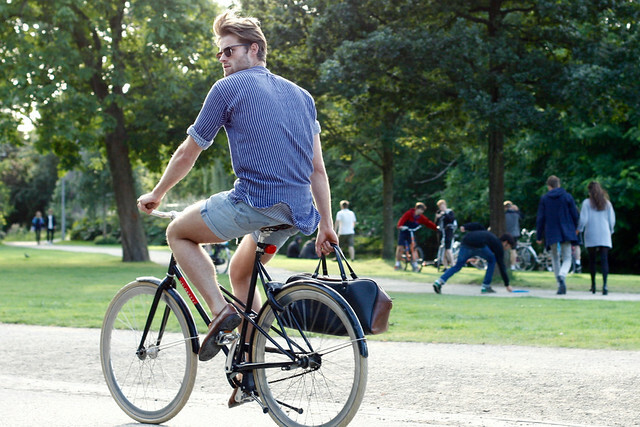 Amsterdam summer is in full swing and this month, we caught up with local resident Gertjan. 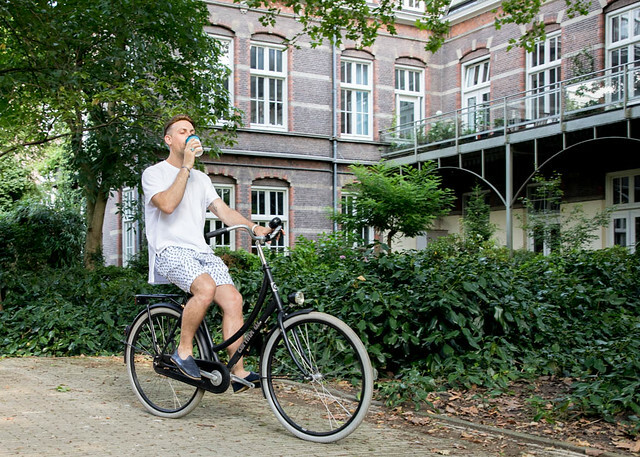 He’s a freelance advertising creative who loves taking his black Veloretti bike for a spin through Vondelpark. 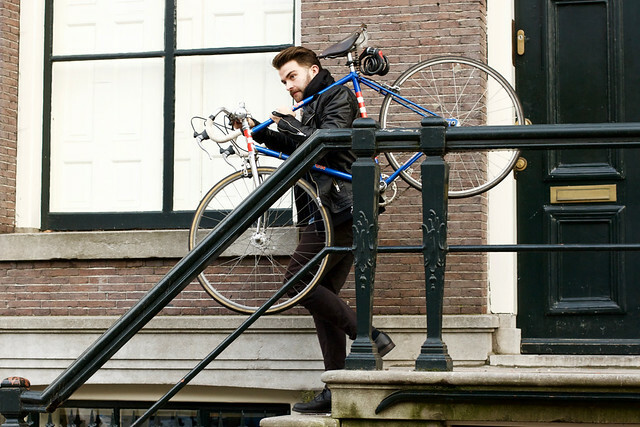 The Dutch are known worldwide for their love of bikes. 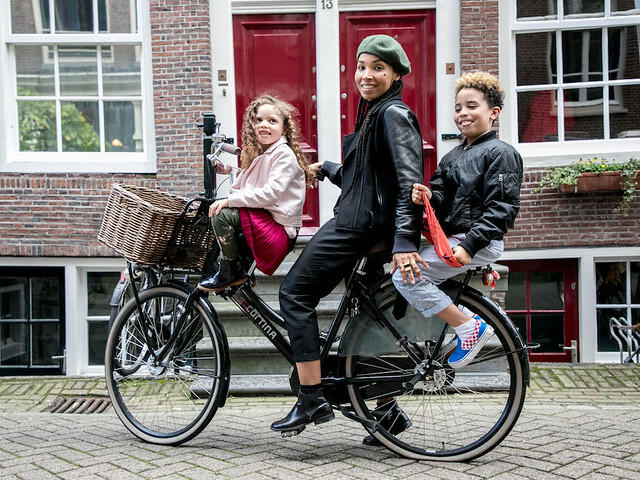 As a Dutchie, did you also grow up cycling around town? For sure! 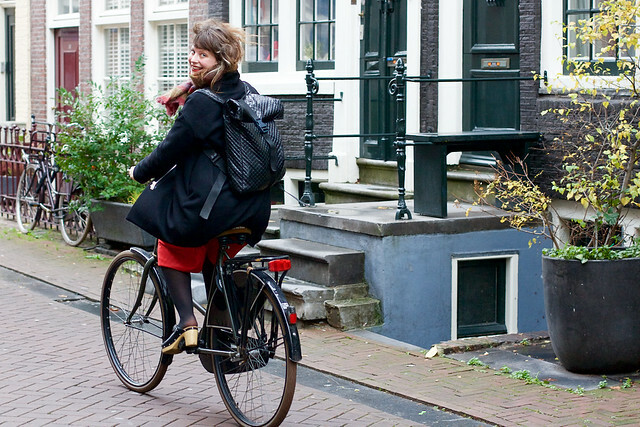 I grew up in a small town in the south of Holland and like many Dutch people, I learned to bike from quite a young age. It was more out of convenience, cycling was the only way to get from point A to point B in that town. 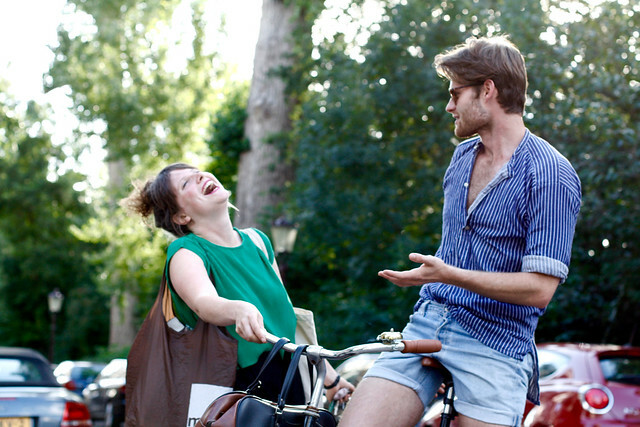 Tell me more about your experience cycling in Amsterdam. 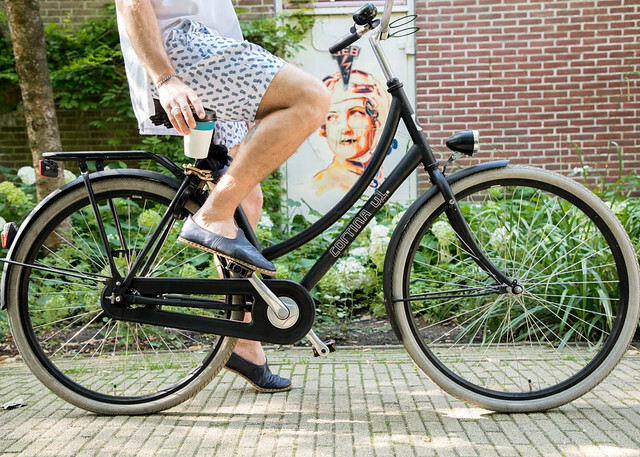 What’s the story behind your lovely zwarte fiets? Before getting this trusty black stallion, I had a bike that was clinging on to life until it finally broke down on my way to a party. Afterwards, I received this bike as a gift. You live and work in the city center. What is a typical day on two wheels like for you? I moved here four years ago and cycling in Amsterdam definitely took some getting used to. Streets are very narrow and bridges can be a challenge but it’s worth the view! Cycling from work to meetings is a fun way to have a breather. I always try to leave a bit earlier and pace myself. That way, I arrive fresh instead of sweaty, looking like I just finished the Tour de France. Do you have a favorite route pass by? Maybe it’s a bit cheesy, but I love going through the Rijksmuseum tunnel! There are always musicians playing good tunes and people buzzing about. I’m so glad they reopened it! The scenery and the socializing! 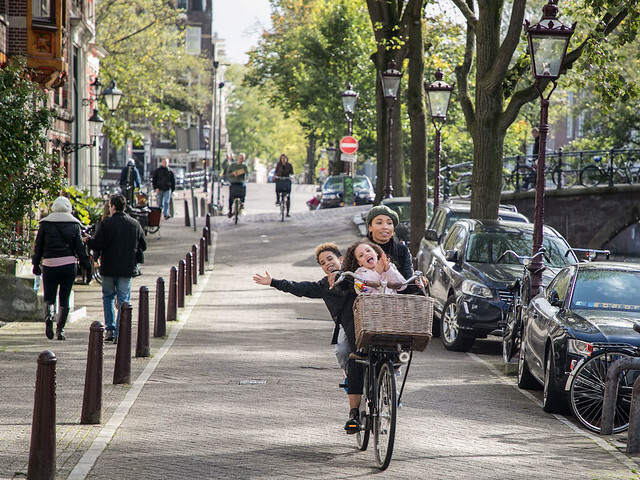 Amsterdam is a beautiful city and perfect to be enjoyed by bike. Amsterdam is also a very a small city so, I often run into friends along the way! On the down side… finding a spot to park and tram tracks can be tricky with your wheels. 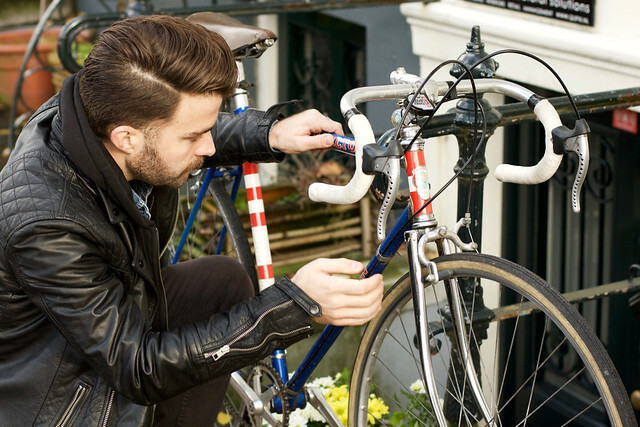 There is always someone on the look out for a new bike, so be sure to lock it up well! With grey skies looming over Amsterdam, my mind easily drifts back to sun soaked Barcelona where I recently spent a weekend sipping sangria at the beach, eating tapas and of course, exploring the unique culture and architecture on offer. 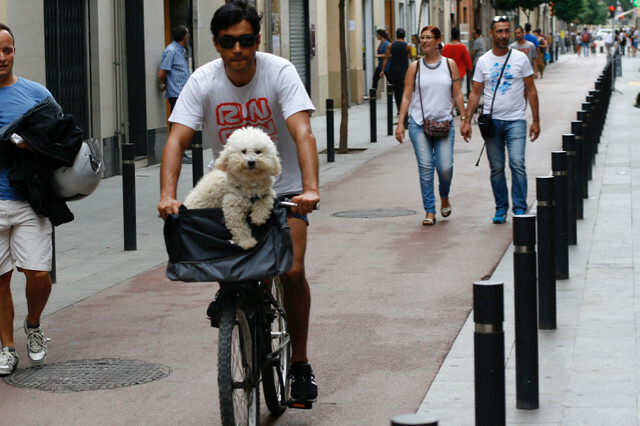 While not traditionally associated with urban cycling, the popularity and infrastructure for bicycles was evident everywhere in this Spanish city. 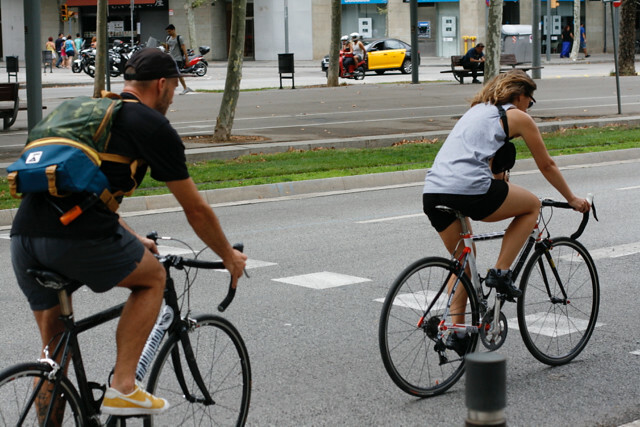 In the last decade, Barcelona has seen a significant jump in riders with the city’s recent investment in new infrastructure such as bike lanes and traffic lights. 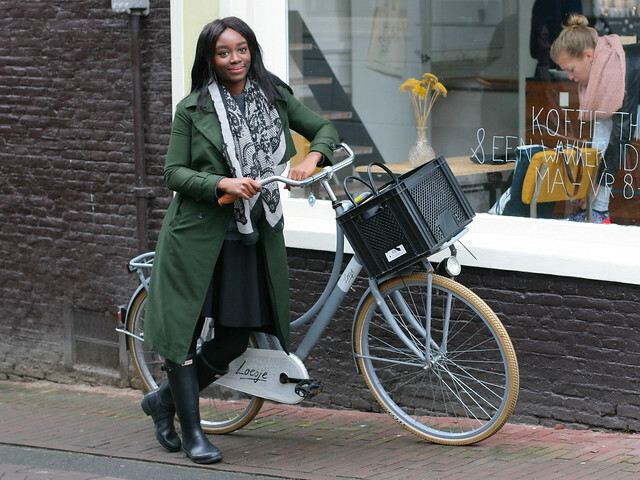 Accustomed to Amsterdam’s bicycle-friendly layout, I was happy to notice all the chic people on bikes – and riding on some nice bike paths. 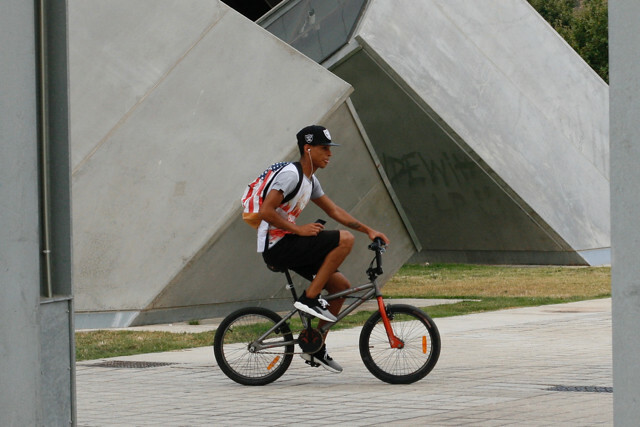 As a daily cyclist myself, I was keen to try out Barcelona’s bike share program Bicing. While deemed as shared public transport and highly popular, it’s only available for locals with an annual subscription. So, instead of taking a spin on two wheels, I instead had the pleasure of snapping photos of cyclists as they whizzed by. 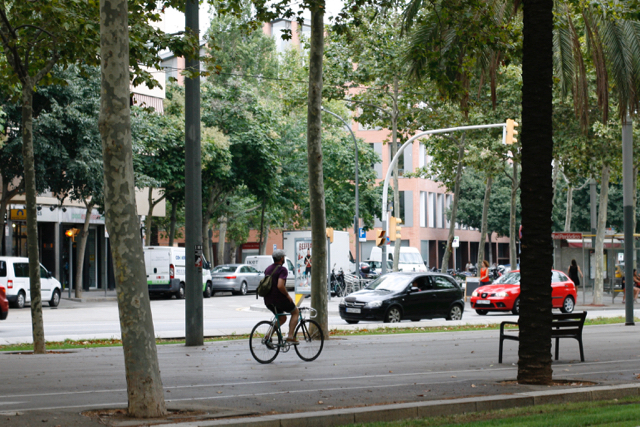 I spotted plenty cyclists of all ages commuting along the city center’s tens of kilometers of cycling paths. Looking for more? 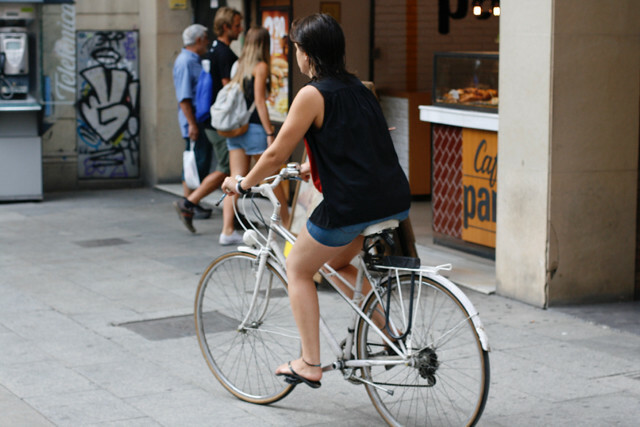 Check out the Barcelona Cycle Chic blog! 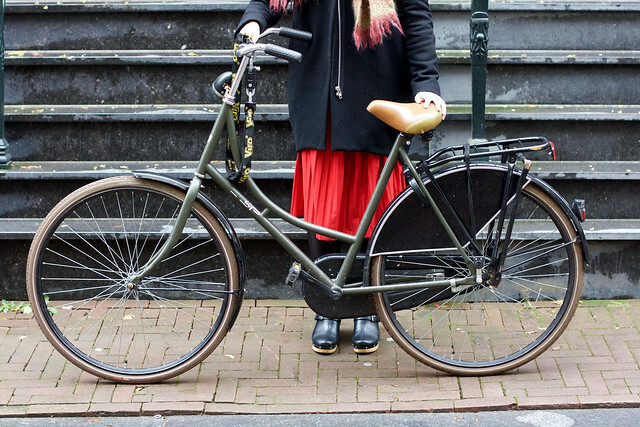 Welcome to the Amsterdam Cycle Chic team, Lily! 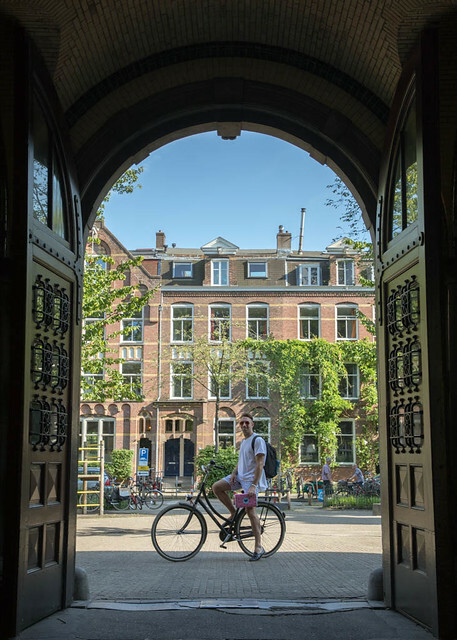 To get started, tell us a bit about where you’re from and how you ended up in Amsterdam. 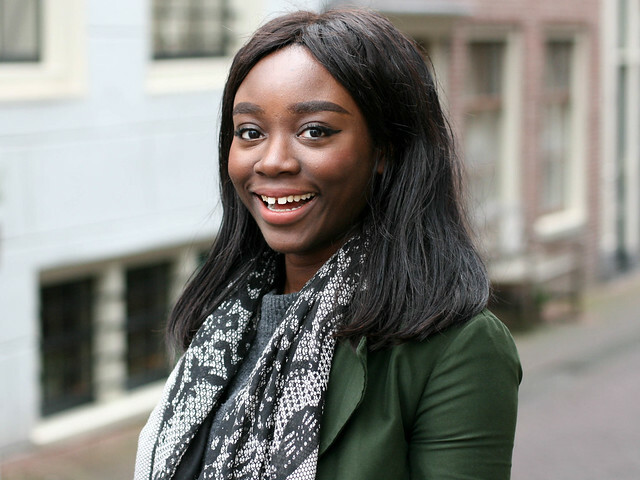 After visiting Amsterdam a few times as a tourist, I came back in 2009 to work as an au pair for a year. That’s when I first learned how to ride a bakfiets! 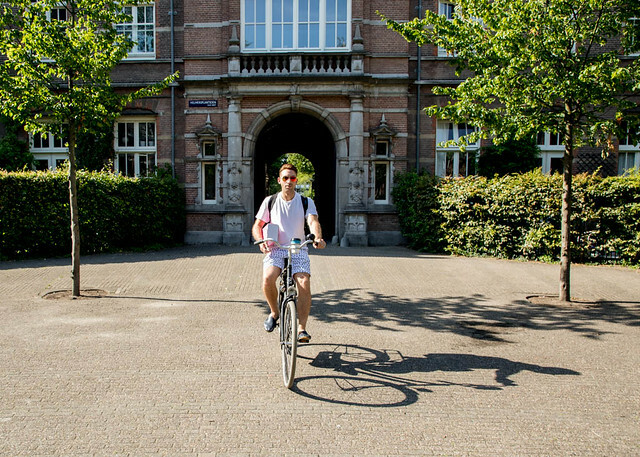 Through the ups and downs, something kept pulling me back to Amsterdam…many adventures and one master’s degree later, I’m still here, cycling around the city on the same yellow bike. What’s the story behind your colorful bike? 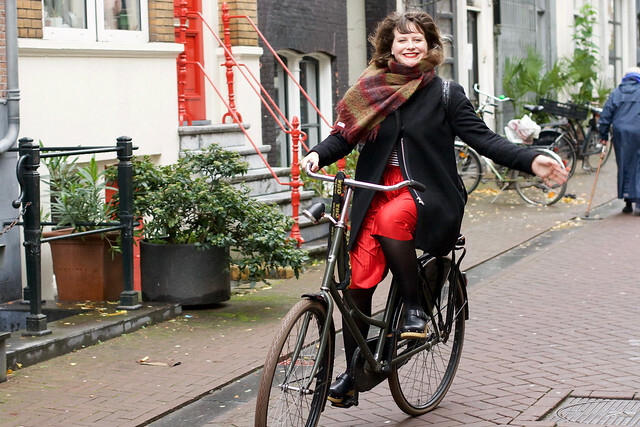 I love that the Dutch cycle as part of their every-day routine and suspected it would become a passion of mine too. So, I figured that a sturdy Dutch bike would be a smart investment and a fun souvenir of my time in Amsterdam. It was winter time when I first arrived and the bright yellow reminded me of the sunshine I desperately missed back home in Orlando. So far, I’ve encountered plenty of adventures with my trusty omafiets but funny enough, she never made it back to Florida permanently and neither did I! At first, I added various colorful, flowery accessories but everything was stolen over time. 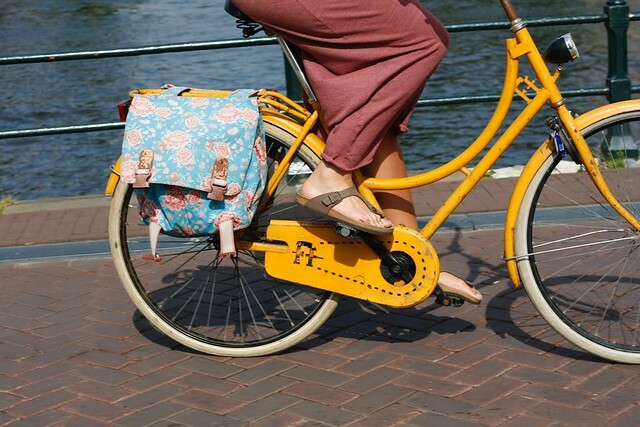 Now I keep it simple with a colorful bell, flowery panniers and of course, a huge lock. 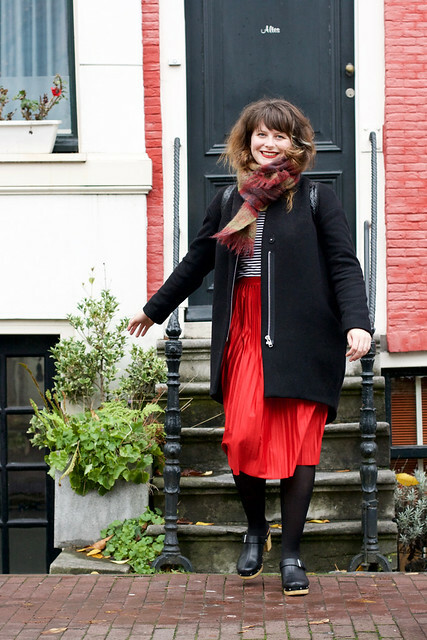 How do you find living in Amsterdam? I absolutely love Amsterdam! 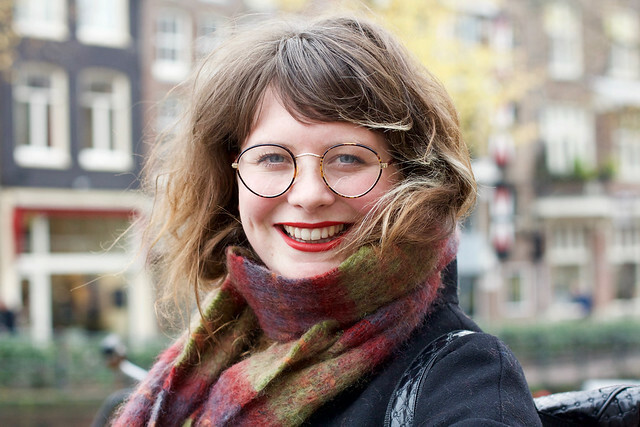 My expat chapter became longer than expected but now that I’ve completed my master’s degree, finished Dutch integration and launched my freelance creative business, it’s really feeling more like home. The convenience! Getting around the city center is faster by bike and fortunately, safe too. The scenery! Nothing beats cruising along the historic canals on a quiet evening or passing over the Amstel with a warm breeze in my hair. The weather! Let’s be honest, it’s never fun to get pummeled by hail, blown over by wind or caught up in a surprise rainstorm (Confession: I eventually gave in and purchased that typical HEMA rain suit out of necessity). 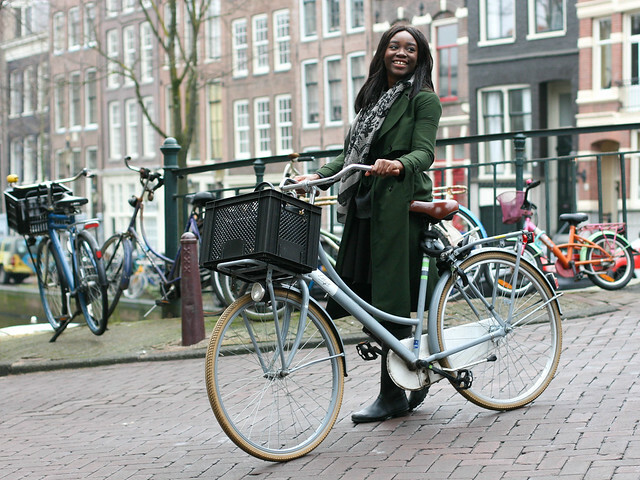 Amsterdam is a utopia for everyday cycling and while living here, I’ve adapted to doing as much as I can by bike. 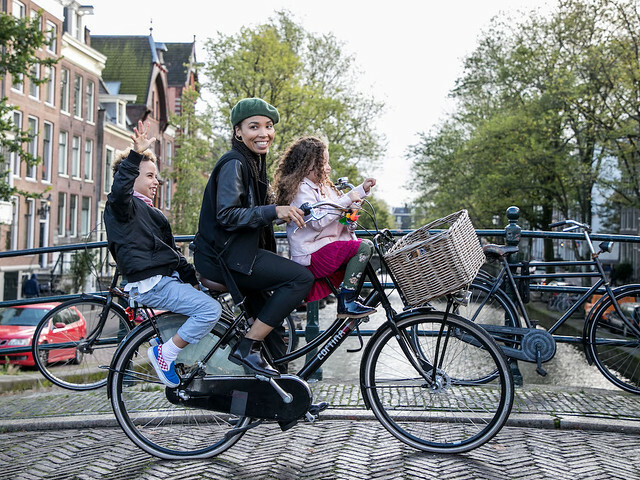 Growing up, I loved riding my bike but unfortunately, Florida doesn’t have the safe, organized cycling culture that we’re so lucky to enjoy here in Amsterdam. 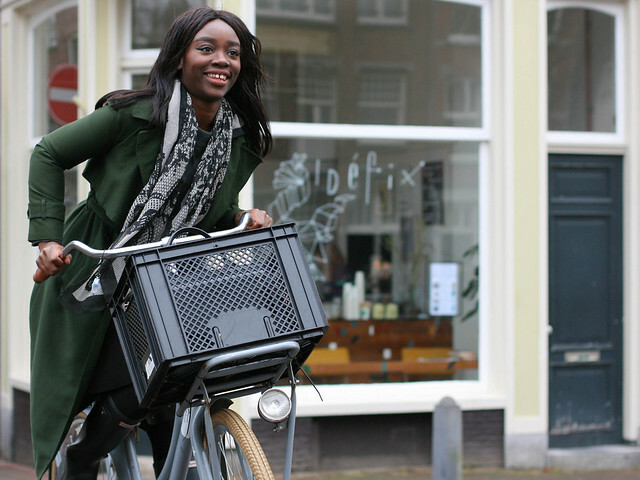 Amsterdam Cycle Chic showcases the city’s bike friendly initiative offering a view of how convenient and fabulous everyday biking can be! 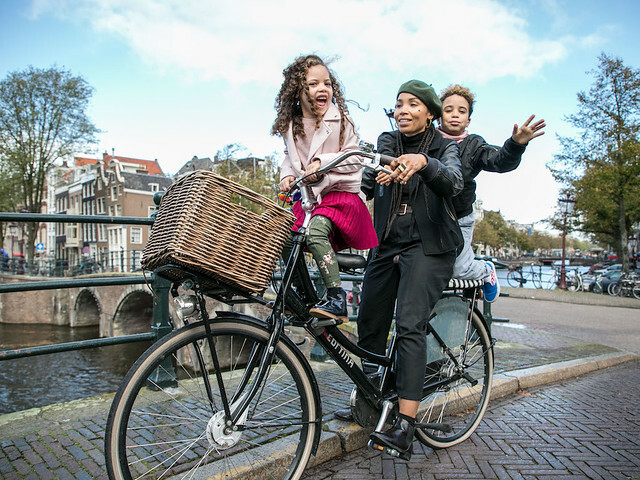 I hope other cities are able to learn from Amsterdam and offer both safety and scenery for everyday cyclists in the future. Plus, I’m often snapping photos around the city to share on Instagram and my travel blog so, joining the ACC team is a perfect fit.